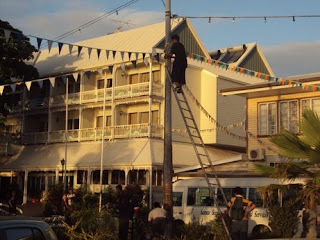 The 2nd Annual Samoa Marathon was held back in June, but I didn’t run. I ran the San Francisco marathon with Brian last August, but by June I hadn’t been training nearly enough. Also it’s ridiculously hot here, and competitive running sounds a little masochistic (although when is running 26.2 miles not a little masochistic?). 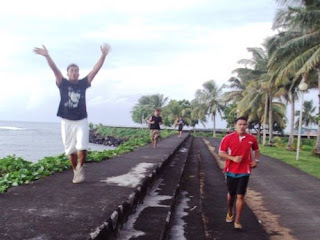 While I wasn’t ready for June’s marathon, I have opted to be part of the Peace Corps Samoa relay team for a 64-mile race around half of Upolu on August 29. So I’ve been running occasionally. The goal is to do three short runs and one long run per week, which has translated to three short runs a week and no long runs in June and one short run per week in July. Oops. 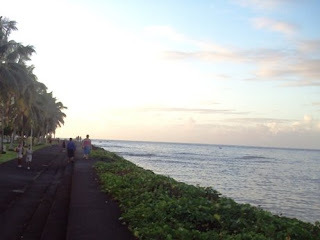 Apia does provide beautiful backdrops for running though. The Sea Wall, the waterfront that runs along the Apia Harbour waterfront was built 10 years ago, seems almost exactly one mile long, which makes it easy to gauge distance. Yeah. I remember living in San Francisco, Brian and I could chart our runs on GoogleMaps to get an idea of distance. GoogleMaps for Apia isn’t quite ready yet. 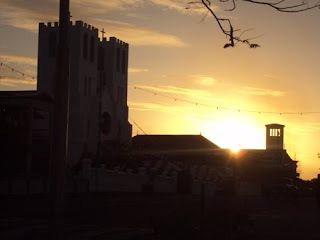 Speaking of GoogleMaps, one of my year 13s did a presentation on job prospects in Apia, and she wanted pictures of some of the more well-known places in town. I was sure that a simple Google image search would yield something, but alas, I ended up walking all over town collecting pictures of CCK, Ah Liki, and Mr. Lavalava. The joke around here is that I am the Google Street View Apia team. Just me. Ha. Timing is delicate issue in this climate. If you run too early, the sun will get you; if you run too late, the dogs will get you. 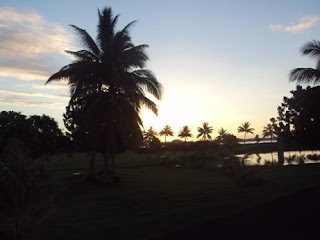 Also, as lax as Apia is compared to other parts of the country, sunset often marks the beginning of evening prayer, and running and physical exertion are fa’asa, forbidden, on Sundays and during times of prayer. I usually head out between 5:00 and 5:30 and no one seems to mind. And the Sea Wall can get relatively crowded in the evening. There are a fair amount of Samoans who head out for an evening savalivali along the Sea Wall. I also see a lot of young men running in packs, which I think are small pockets of rugby teams in training. The Sea Wall goes in along the inlet and then juts out in the water around the back side of the government building. There’s a park back there and there’s usually a pick-up game of soccer or rugby going on there too. Often when I’m nearing the end of my loop back to my house, I pass an older Samoan man who wears the same rust-colored shorts and t-shirt and a worn pair of running shoes. He’s almost always gives me a big smile and a “Nice job running!” in Samoan. It makes me feel good. It makes me feel like I should run more often. Joey 81, the unofficial relay coach, would agree with that sentiment. Hope you're keeping in shape. Pictures below. Taking down the flags over Aggie Grey's. 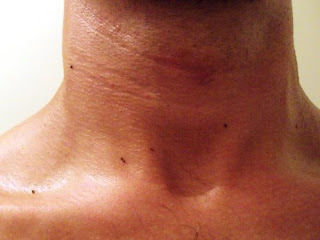 There were a couple of clouds of small bugs I ran through tonight, and when I got home, my neck looked like a car windshield. Gross. So, if this were a 10 person relay, it would only be 6.4 miles each....you can handle that on the amount of training your doing easy. But something tells me it isn't a 10 person team, huh?